Small size, big versatility the CTMG 48-inch grapple for compact tractors up to 38 HP handles limbs, prunings, debris and so much more. Single upper grapple of 3/8” steel is 31” wide with CNC cut gripping notches cut into the tines to help retain brush and other loose materials. 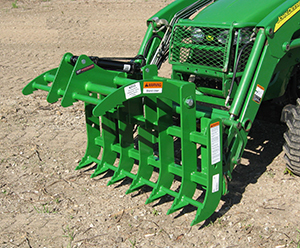 48-inch lower rake is made from 1/2“ steel also featuring gripping notches to help retain loose materials. Heavy-wall tubing runs through the lower tines with gussets placed at each point of contact for added strength. Two models are available, CTMG-48S for those loaders with the skid steer type mount, and CTMG-48JD for those loaders that use the John Deere hook & pin type quick attach mount (200X, 200CX, D120, D160, H120, H130, H160). Both units feature standard parking stand for easy storage & parking of the unit on a hard flat surface. 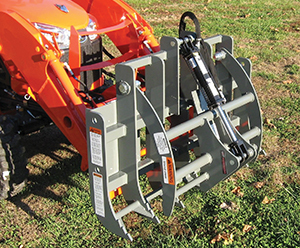 Sized to allow use on compact tractors up to 38 HP. Upper grapple, lower tines have gripping notches to help retain loose materials. Greaseable pivot points for long service life. Shipped less hoses & fittings, allowing the dealer to correctly match the hose length to the tractor / loader. Tractor remote hydraulic ports are required to operate the grapple. Cylinder Size 2" x 8" 2" x 8"
WARNING: Read and understand the operator’s manual before operation. Be sure tractor/skid steer is properly counterbalanced. Damage to equipment or personal injury could occur.